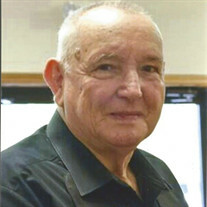 Dane Golden Gilbert, 79, of Pleasant Plains passed away December 31, 2016. He was born October 3rd 1937 in Pleasant Plains Arkansas to Golden Gilbert and Josephine (Blankenship) Gilbert. He was a member of Union Grove Missionary Baptist Church. He enjoyed fishing, hunting, gardening, and time spent with his family and grandkids. He was preceded in death by his parents; his wife Sarah (McDougal) Gilbert; one son Danny Gilbert; one sister Inez (Gilbert) Reeves McDougal; and one brother Nuel Gilbert. He is survived by two sons: David Gilbert and his wife Ricki Ann , Jason Gilbert and his wife Desiree; three daughters: Naomi Davis and her husband Randy, Elizabeth Blanton and her husband Chico, and Mary Gilbert; three brothers: Noel Gilbert, Doyle Gilbert, Roland Gilbert; 30 plus grandchildren and counting; and a host of other relatives and dear friends. Visitation will be Tuesday, January 3rd from 6-8 PM at the Willis Funeral Service Chapel. Funeral Services will be Wednesday, January 4th at 2 PM at the Union Grove Missionary Baptist Church with Bro. Reagan Shearer officiating. Interment will follow at the Union Grove Cemetery.